With the launch of Samsung’s Galaxy S6 and S6 Edge, and HTC’s One M9, one of the main question on everyone’s mind was which device will perform better. After all, both of them come with industry leading chipsets on board, namely the Snapdragon 810 and the Exynos 7420. Samsung caused quite a stir around the mobile world when it became rumored that the Korean manufacturer was choosing to drop Qualcomm’s jewel in crown with one of its own in house SoCs. And it had every reason to do so. After all, the Exynos 7420 is manufactured on Samsung’s very own 14nm FinFET manufacturing process, giving it not only significant performance, but also power enhancements. 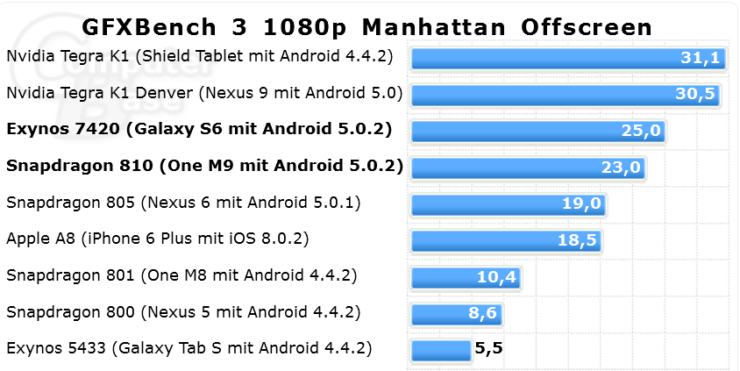 So if you’re wondering how the two stack up against each other, and against Apple’s A8 (found in the iPhone), take a look at the benchmarks below to find out. Starting with GeekBench multi core, Samsung’s 14nm processor manages to take a solid lead over Qualcomm’s Snapdragon 810, something that will continue for the majority of the benchmarks that we’ll be sharing with you today. While both the processors use the same Cortex cores (A57 and A53) in eight sets, the Snapdragon 810 clocks at a higher speed of 2.0 GHz. The Exynos 7420 on the other hand has appeared quite a few times with a maximum clock speed of 1.5 GHz, which lets probably Samsung keep the thickness on the Galaxy S6 to a minimum. While the Exynos still beats the Snapdragon in Geekbench Single Core, Apple’s A8 still is on the top when it comes to singe core performance. This can most likely be attributed to the Cupertino manufacturer’s superior software + hardware integration and shows us that while behind in some areas, the iPhone is still a strong contender for SoC specifications. Moving towards more CPU performance, the Exynos 7420 leads the Snapdragon 810 by a percentage margin of 19 in integer performance, a critical aspect of CPU performance. 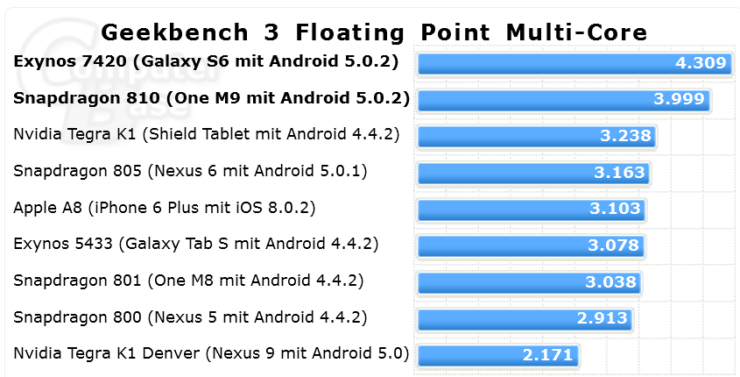 The A8 still manages to top the Exynos 7420 over here however, showing us once again the relative strength of Apple’s software integration on the iPhone. Coming towards multi core however, Samsung’s 14nm FinFET manages to nearly double its numbers over the iPhone’s A8 and also once again takes a clear lead over the Snapdragono 810. This difference most likely results from overall improved efficiency which results from the 14nm process. 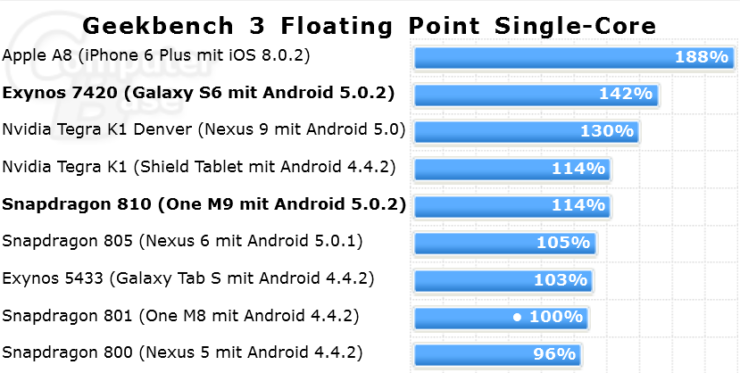 These single and multi core results become even more evident in floating point cores, shown below. Coming toward graphics performance on both the units, or more specifically the Adreno 430 and the Mali T-760. Starting from IceStorm, its evident that Qualcomm knows its GPUs. GPU strength for the American manufacturer has been a strength for quite a while, as we have told you on previous occasions as well. The Adreno 430 manages to out-perform its Mali counterpart in IceStorm below. 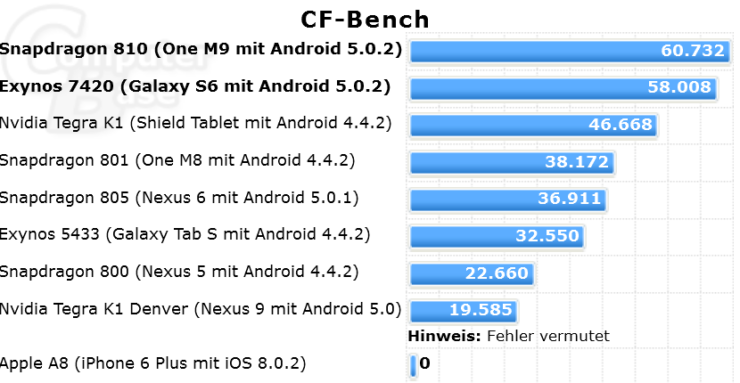 The Snapdragon 810 also manages to take a lead over the Exynos 7420 in CF Bench, showing that Qualcomm’s not out of the race just yet. However, looks like Samsung’s put quite an effort into the Exynos 7420 and the Galaxy S6 as Qualcomm’s lead doesn’t stay for both GFX Bench 1080p T-Rex and Manhattan Offscreen. Of course we would be able to better predict their scores with an Onscreen test as well, since its much more straining on the GPU but thest scores just go on to show that if Samsung’s processors continue to perform the way today’s benches suggest, then we could very well see them become one of the mainstream processors in the Android world. But thats just speculation for now. Take a look at the scores below. So that ends our benchmark analysis for both the Snapdragon 810 and the Exynos 7420 today. Samsung’s come a long way in its processors over the past couple of these years, and the debut of 14nm FinFET with the Galaxy S6 and Exynos 7420 has put Qualcomm in a tough position indeed. The latter’s Snapdragon 820, which Qualcomm showed off yesterday is not expected to be available till the end of this year or the start of the next, so it gives Samsung plenty of time to solidify its lead. Let us know what you think of the scores in the comments section below.